Going up against a knife fighter when all you have to defend yourself with is a pair of fists is a daunting proposition for anyone, no matter how skilled. 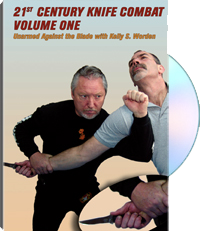 In order to survive to fight another day, you need the techniques and principles taught by master martial artist Kelly S. Worden in 21st Century Knife Combat, Vol. One from Paladin Press. In his one-of-a-kind, in-your-face style, Worden first takes you through the basics by teaching you how to deflect slashing and stabbing attacks on the high line while disrupting your opponent's base with kicks and foot traps on the low line. He then transitions to high-speed attachment techniques that enable you to stick to your attacker so his knife has nowhere to go, putting you in a position to destroy his most vulnerable targets with lightning-fast hand strikes. In addition to showing defenses against takedown attempts and all-out thrusts with the blade, Worden also goes into redirecting your opponent's attack using simple principles of joint manipulation, sending the knife point toward him rather than into you. 21st Century Knife Combat, Vol. One is the first of a three-part video series on dealing with knife combat in today's violent society. For information purposes only.